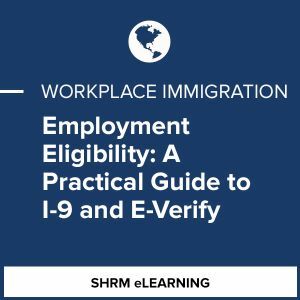 The Employment Eligibility: A Practical Guide to I-9 and E-Verify course gives a comprehensive overview of the employment eligibility statutes, Form I-9 requirements and the E-Verify system. This course includes real-life scenarios and activities based on Form I-9, which will prepare you to effectively manage the employment verification process for your employees. The course utilizes the recently released, 7/17/2017 version of the Form I-9, Employment Eligibility Verification. No matter if you oversee hiring at a large company with multiple offices across the US or an HR manager at a small business with just one location, it is your role to ensure I-9 compliance at your organization. The course is essential for all HR professionals who are involved in hiring and employment verification.